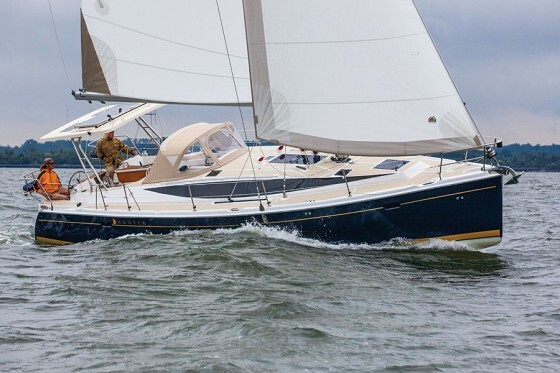 A new model, a new name, and new ownership for Hunter sailboats looks like a step in the right direction for a sailboat builder that has been around since 1975. Hunter Marine has changed its name and its ownership, and considering that David Marlow - creator of bold initiatives like the Marlow Ocean Challenge - now has the helm, it might be reaching to change its reputation as well. Hunter exited bankruptcy and received a much-needed cash infusion when it was bought by Marlow Yachts, the builder of large, luxury powerboats. It then set about launching its first model, the Hunter 40, which seems to have benefited significantly from the recent arrangement. 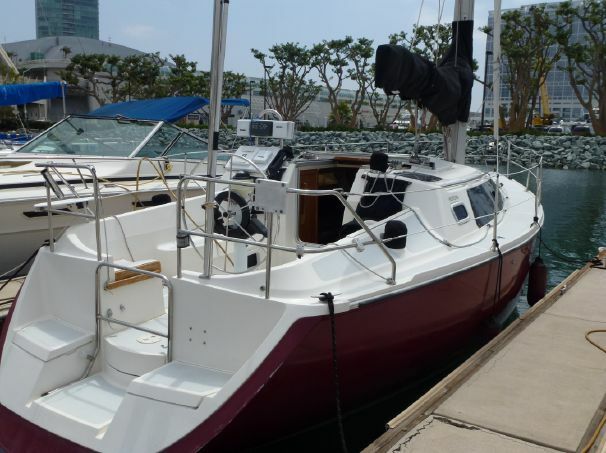 The Marlow-Hunter 40 represents a new start for a storied name in sailboats. The rumor is that the first design to come from the new company took less than two months from paper to water, and it made its debut at the Annapolis Boat Show in October 2012. Sitting at the dock, it looked better in person than on the drawing board, where the design seemed boxy and plump. Viewing it from the opposite dock, I noticed its nearly plumb bow, low coachroof, and reverse transom. The effect was aggressive and speedy-looking. I stepped aboard the drop-down transom and up to the twin helms in the aft or “working” end of the cockpit. The main and genoa sheets are led here so it’s easy to singlehand without disturbing the social activity forward, where there are two settees and a drop-leaf table with a swiveling centerline chartplotter mounted below. There’s no backstay to get in your way as Hunter continues to use its B & R rig with aft-swept spreaders. The mast is stepped well forward on the deck, creating a large roachy main and a fairly small foretriangle. 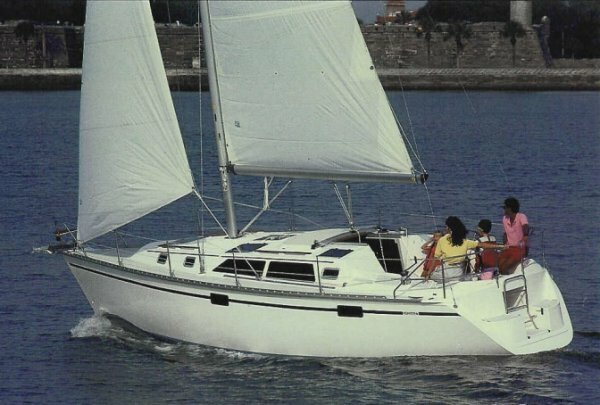 Two mainsail configurations are available; standard with battens and lazyjacks, or in-mast furling. 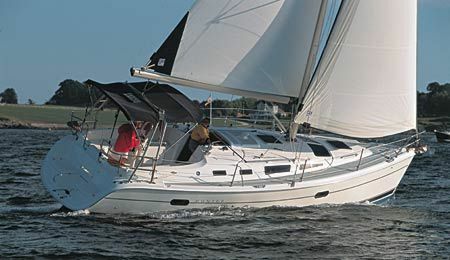 Since most of the power will come from the large main, I’d choose the standard configuration as well as the deep-keel option (6’ 8”) for better upwind performance. The cabintop is low, giving the boat a sleek appearance. Gone are the days of tiered, wedding cake-like profiles that Hunters were known for. The two-tone deck helps break up the expanse of white, and the stretch of sharp windows helps create the illusion of length. From the inside you can see that the swoopy windows are actually two ports on either side with the pointiness added with paint, an old powerboat trick. Below, the Marlow-Hunter features rich wood tones and multiple configurations. Another powerboat-like feature is the hard Targa top over the aft section of the cockpit, which is much like what you’d see on center-console fishing boats. This feature has many pluses and one minus. First, it’s a great attachment point for the main sheet, so there’s end-boom sheeting and a place to mount a fairly substantial traveler. Second, the hardtop is integrated into an arch, which provides good handholds on deck, and it has cutouts so you can see the sail from the wheels. Finally it’s a hardtop, so it will not need replacing like canvas, and it’s an ideal place to mount a solar panel where performance will not suffer from shady spots. These are all great features, but I found that no matter your height (I’m only 5' 5") you’re likely to bang your head on it as you transition from the deck to the cockpit until you learn to live with it, and duck. 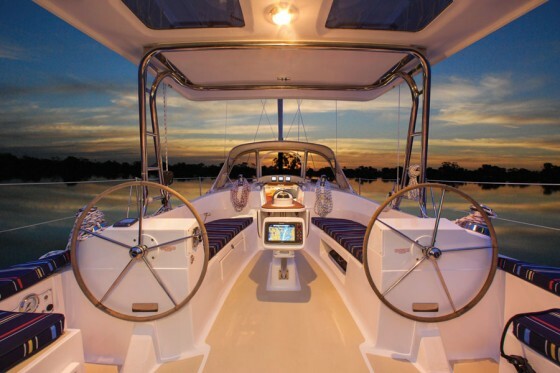 Below, the H40 leans toward luxury with many amenities and improved joinery. 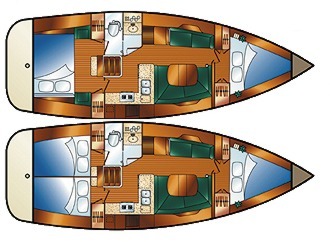 Two configurations are available with two or three cabins and two heads. Come down four steps into the starboard-side galley. With a two-burner stove and oven combo, a microwave, Corian counters, and good countertop handles that also function as fiddles, the L-shaped galley is functional, serving up all a cook will need to turn out gourmet meals for the crew. Across from the galley is the aft head that comes in two configurations – a larger one with a stall shower if the nav station is pushed forward into the salon, and a smaller one if the port side settee has three sections rather than two. To starboard is a U-shaped dinette with a hi/lo table. The name Hunter has been around for a long time, but now that Marlow is in the mix, a new age is dawning for this classic sailboat builder. It’s hard to figure out which cabin will be used as the master stateroom. 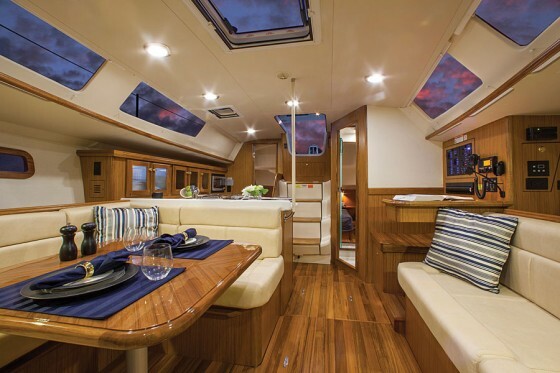 The aft cabin has a centerline bed, cedar-lined lockers, and its own access to the head. But personal taste would make me opt for the forward cabin where there’s more headroom, if there was an option to delete the forward head and push the berth back, making it into centerline queen accessible from both sides. At the moment, there is no such option available. The sole is a grooved hardwood with rich woodgrain detail that adds to the ambience below, and I heard many boat show goers comment on its beauty. Despite its appeal, however, I know that what works at a boat show doesn't always play as well in daily use—I'll reserve judgment as to how hard it will be to keep dust, sand, and spills out of those pretty little grooves. The interior finish is available in either a teak or cherry matte veneer with a nice high-gloss dinette table. The H40 comes with a 40-hp Yanmar diesel with Saildrive. If you expect to spend time pushing into head seas, it may be a good idea to upgrade to the 54-hp engine. Under sail, the Hunter 40 will do seven to eight and a half knots of speed in 10 knots of true wind at 60 degrees, in flat water. That’s excellent for a 36-foot waterline. Off the wind performance will most likely be helped by the hard chine in the aft section of the hull. 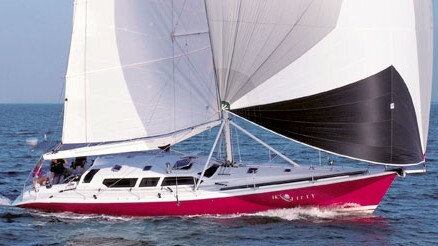 Under power and with the bigger engine, the boat will do seven to eight knots depending on conditions. Sail area (standard) 1,006 sq. ft.
For decades now, Hunter has been pushing the envelope of practical design and boater comfort. 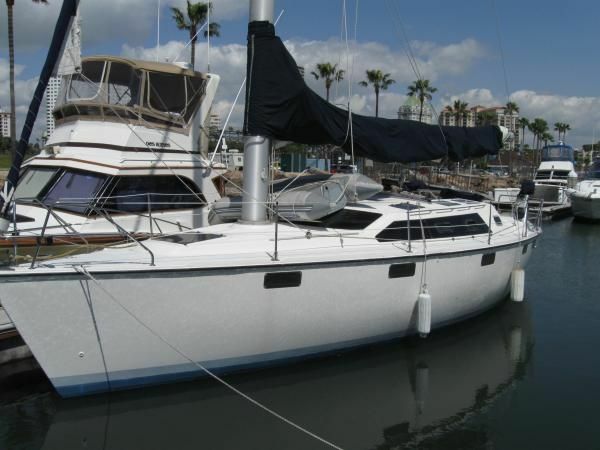 In fact, I'd say Hunter has done much to transform the sailing experience and has even put pressure on staunch builders of traditional bluewater cruisers, who have had to relinquish their tight grip on the salty attitude that sailing is all about roughing it, and is only for the hardy. From Hunter's roomy interiors (the H40 has 6' 6" headroom) to unique little touches like a dish rack that dries as well as stows the dishes, boats wired with routers for WiFi, six-place settings of dishes (included), and high-end entertainment packages (Bose stereo and flatscreen TVs), Hunter’s feature-rich designs have led the way in bringing a little more comfort and user-friendliness to production sailboats. In the past, some have called those creature comforts tradeoffs for performance. 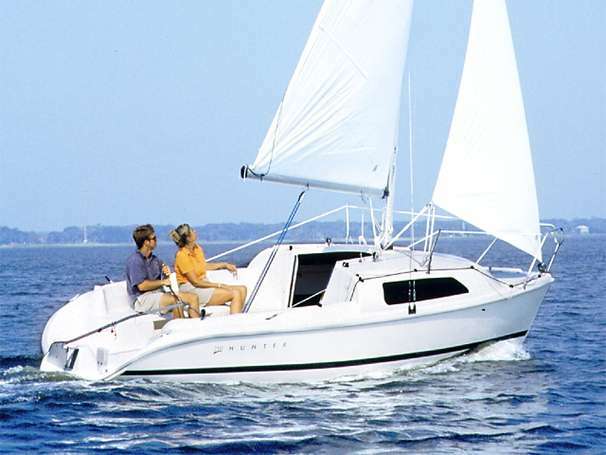 The 40, however, seems determined to change that perception—as it sets the bar a little higher for both comfort and sailing ability. Add to that a price under $220,000 (depending on options packages) and there’s much to celebrate about Hunter’s newest baby. Marlow-Hunter launched its new hull and new company with the slogan, "Life begins at 40." With the quality of their first design, they might be right. For more information, see our Short Take Video of the Hunter 40, or visit Marlow-Hunter.